Little known fact: I played the turkey in the Thanksgiving play when I was in fourth grade. If I can find the photo, I will scan and post it. 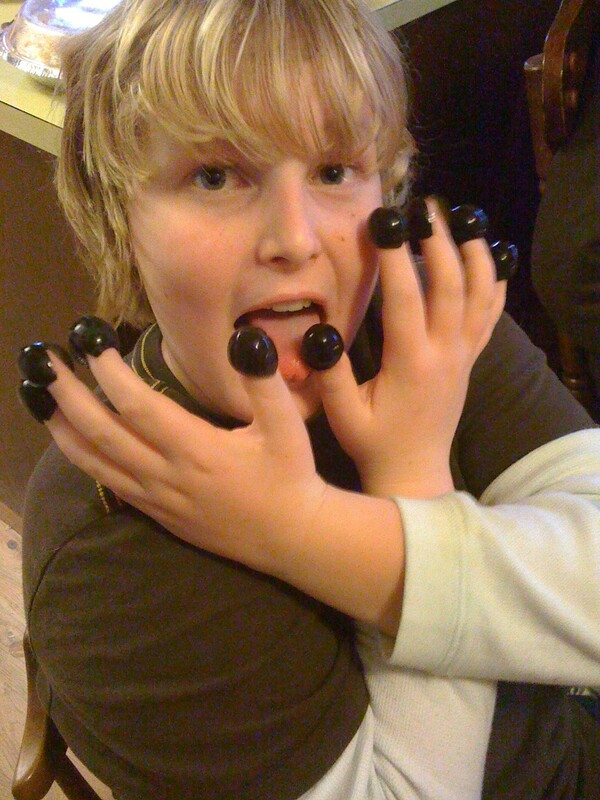 Four years ago and not much has changed when it comes to black olives. My husband who laughs when I act out conversations I have (either real or in my imagination). The stacks of novels waiting to be read. My kids, especially when they’re getting along and having fun, but even when they leave the butter on the counter where the dog can eat it. Friends I know through the computer who take the time to say, “Hey, me, too!” from time to time. Real life friends . . . wish we all lived in the same town, though. A house with a pantry and a perfect office space for me. Sunshine. On my shoulders. Makes me happy. Health. The older I get, the more lucky I feel. And I’m thankful for those of you who read this blog. If this blog were a person, it would be in fourth grade, so hopefully the best is yet to come. Which brings me back to what I was doing in fourth grade . . . playing the turkey in the Thanksgiving play. See how I did that? The circle of life blog. happy thanksgiving Mel…I wish i lived near the ocean! One year ago I spent this holiday at your house. Your Beautiful house. Your house near the ocean. Your house with………..you get the point. Anyhow, I love that you blog about such fun things as what you did when you were little or what your dog is eating off the kitchen counter – makes me feel like my life is boring, but I can take boring. Boring is good when you are my age. I remember doing the early morning shopping with you on Black Friday years ago. Hope you’ll get to sleep in this year. I shopped on-line a week or two ago, and the mailman brought my package yesterday, so I’m set. One more order to place, and then I quit. Then I’ll need to look for the gift I bought last June and haven’t seen since! Eat a second piece of pumpkin pie for me, please. I’m too full to do it myself.